Besides the route taken to get to Punt, another key aspect in situating the Land of Punt is the flora and fauna of the various proposed locations for the ancient territory. Specific plants and animals, which are said to have been native to Punt, are depicted on Egyptian temple walls and murals. Some of these “wonderful things of Punt” were also brought back to Egypt as gifts and offerings. Combined, this leaves us with invaluable information as to what kind of habitat the Puntites actually lived in. Of all the items that were exported from the Land of Punt to ancient Egypt, frankincense was by far the most important. 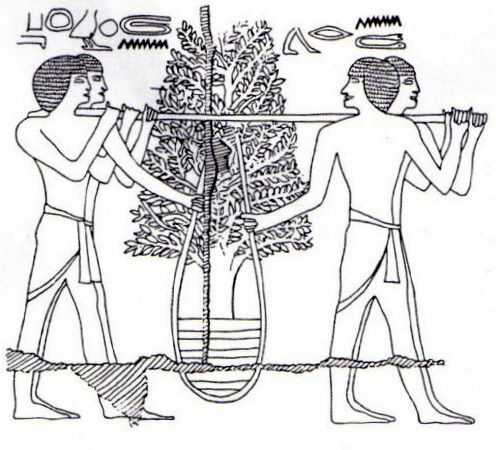 In 1989 Abedl Monem A. H. Sayed notes that the Deir el-Bahri murals record Pharaoh Hatshepsut as specifically commanding her party “to fetch (as the texts say) ‘fresh incense’, and ‘frankincense living trees’ from ‘the frankincense terraces of Punt’.” The main purpose of that Egyptian voyage to Punt — the largest sojourn of its kind to the ancient territory — was, therefore, to retrieve the prized aromatic resin. Indeed, the very reason why Hatshepsut organized such a massive expedition was because she wanted her men to bring back live frankincense trees for later transplantation in Egypt. Her temple reliefs show that each of the 31 heavy incense trees required 4 to 6 men to transport them to the cargo ships, or 124 to 186 Egyptian and Puntite carriers in total. Since there were around 150 crewmen on the expedition’s five vessels (30 per ship), this would mean that “the frankincense terraces of Punt” had to have been situated near the shore. Abdel Monem Sayed (1989) remarks that the ancient Egyptians imported two types of frankincense: a lower grade variety called sntr, and a higher grade variety known as ‘ntiyw or nty. From laboratory analyses and philological.The identity of the “nty” tree is still a matter of controversy. Scholars hesitate between “Olibanum, deriving from varies varieties of :Boswellia” in both Africa and Arabia. Although in an Edfu temple inscription gives a clue that Egyptians preferred the resin of Arabian origin. The Boswellia Sacra, which grows in the eastern Hadramaut Al Yaman and in Oman and its the much similar to the Egyptian drawing than the other varities. The Boswellia pappyrifera found in Eritrea and the Boswellia frereana is found in Somalia. Over the saplings which are being carried in baskets, is inscribed Nehet Ana; that is to say, the Sycamore of Ana. Elsewhere we see the full-grown trees. The trunk is massive; the leaf is a sharp-pointed oval; and at the junction of the trunk and the larger branches are seen little copper-colored lumps of irregular form, representing the resinous gum which has exuded through the bark. A passage in Pliny, to which Mariette especially refers in his memoir on Deir-el-Bahari, shows that this tree, the odoriferous sycamore, can be none other than the myrrh-tree, whose gum was brought by the ancients from the so-called "land of the hermits/cave dwellers." were the myrrh-tree is found." There is a long inscription engraved in vertical columns at either corner of the picture reads as follows according to Mariette:" Very great lading of the ships with the marvels of the Land of Punt, and with all the good woods of Ta-nuter; with heaps of kami of Ana, with trees producing green ana; with ebony and pure ivory; with gold, and green agates found in the Land of the Amu; with blocks of the wood tascheps; with ahem perfumes; with tasem dogs; and with hides of the panthers of the South; and with natives of the country, their women and children. Never since the beginning of the world have the like wonders been brought by any king." An ox is then sacrificed to Amen, the sacrificial act being depicted in a bas-relief, from which, unfortunately, the next block is missing, thus carrying away one corner of the subject. Here we see the altar of the god loaded with offerings, among which may be noted a haunch, a goose, and various kinds of cakes. Four priests uplift their hands in adoration; another carries a small stand; while two more cut the slaughtered ox limb from limb. Following the sailors, comes the deputation from Punt. Some of these bring trays of the Ana gum (specified in the inscription as "green Ana"); others carry large jars, probably filled with gold-dust; others, again, lead apes of the two species indigenous to Punt, called in the inscription the Ani ape, and the Kafoo monkey. To this part of the procession belong the figures of men leading the horse, the giraffe, and the elephant. Last of all come more sailors, carrying the sycamore saplings in baskets as before. The Ana was undoubtedly the resinous gum of the myrrh-tree is still further confirmed by the above passage from Pliny, which describes it as of a green color; the "green Ana" being constantly named in Egyptian inscriptions as the most precious and desirable kind." Mr Fehmi Kushiem noted that the Nabatean Gum which came from Edom and not Somalia or Yemen, is what was originaly called Arabic gum. 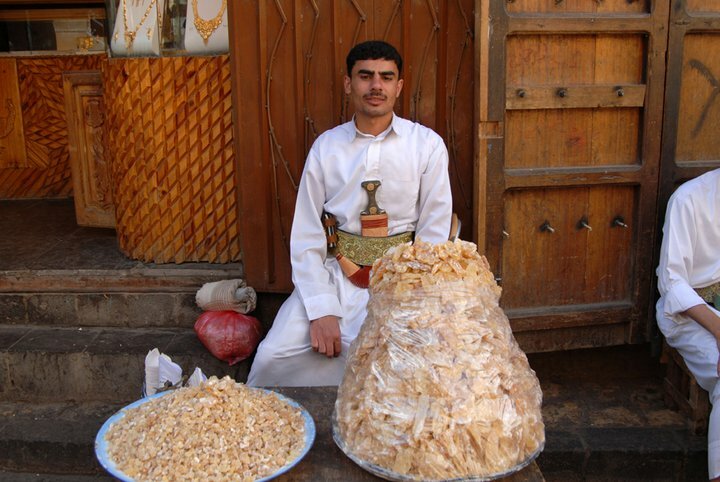 He explains that the arabic gum that is also called "Kaman" which originated from the old Egyptian "Qmit". There are many evidnce of a flourishing trading between the region and Egypt. And it is well evedant that the Nabatean Gum was much superior and different than the Somalian or Hadrami "Yemeni" Gums. The Nabatean Gum is less dry and more potant for medicale use. In todays market prices the Pistacio Atlantica gum is many times more expensive than the Somalian and Yemeni or Omani Gum. The only place that is still harvesting and selling is an Island called "Chios" in Greece at the Agean sea. It is also know as Mistika and they are selling it for 1804 per kilo. At the Chios Island airport they make sure no body leaves with any transplanted gum trees from the Island. The Pistachio Terebinth tree resin gum “the tears of Horous”. This tree resin was the most expensive in the ancient world and the most sacred, which could only be found in Petra due to it's rich crystalline rock minerals. Terebinth resin was widely used as a preservative in ancient wine because it has the ability to kill certain bacteria. In the region the Pistachio Terebinth trees is regarded with veneration among the bedouin tribes. The biblical text contains many references to this tree. It is believed that Abraham received “heavenly visitors” under the same kind of tree at Mamre. 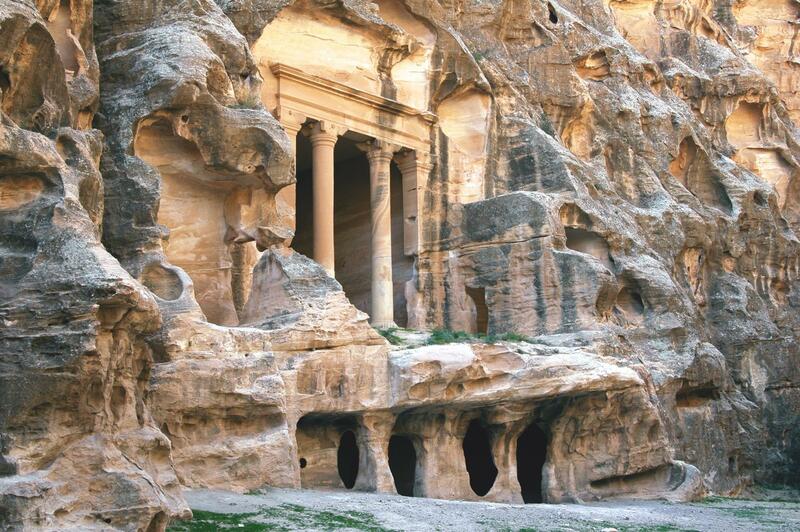 Evidence from the Siq Al Bared in Beidha near Edom or modern day Petra suggest that the Nabateans were celebrating a great agricultural secret, just like their trade routes partners-the Greeks, celebrated at Eleusis. The Greek Eleusis mystery was investigated by Robert Gordon Wasson and Albert Hofmann in the 70’s. Meeting at a mushroom conference in San Francisco in 1977, the two pioneers concluded that Eleusis was a rite of visionary intoxication. Like the Elusis Mystery, the Nabatean Mystery seems to have been a ritual of intoxicants. This Nabatean Mystery seems to have evolved from a more ancient shepherd’s mystery religion that originated from around the Caspian Sea. They viewed these plants as places where divinities reside, and thus used them in religious ceremonies, initiation rites and healing. Around 310 BC, Diodorus Sciulus also wrote an account of the significance of Balsam to the Nabateans. He spoke of Balsam as a vital medicament needed by all physicians, and since it did not grow anywhere else in the world, it was a source of immense income for the Nabateans. 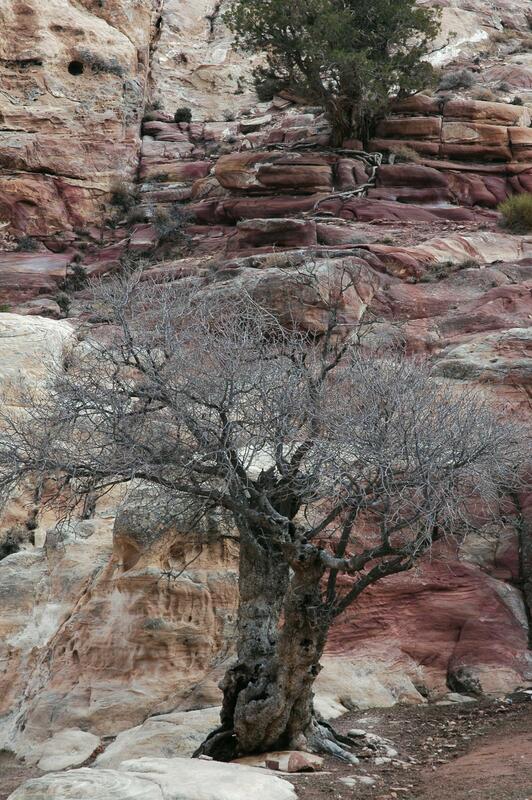 The Nabateans, however, were not the only people who knew about this secret plant. It is believed that the Essenes also worked with it, around the same time as the Nabateans. The Essenes were an ancient ascetic Jewish sect that lived in highly organized groups; they are credited as the authors of the Dead Sea Scrolls. In the1990's, archeologists uncovered an ancient Jewish village on the edge of the Dead Sea in En-ged. The village had been abandoned after a fire in the 6th century AD. It held the lost secret behind the production of the prized balsam oil that was used to anoint the kings of Judah and other monarchs in the ancient world. The entrance to the balsam factory was sealed with a stone, and in the village, a curse was inscribed on the mosaic floor of a synagogue: “Cursed be he who reveals the secret of the village to the Gentiles.” This secret was in reference to the oil-production formula. It is evident that both the Nabateans and the Essenes were safeguarding parts of what had remained from the old and mostly lost knowledge. They knew the sacred substance that was used by the ancients. The Fig tree (Bedouin: Teen) is indigenous to the rock and gorges of Wadi Rum, Petra, and Sinai. The wild Fig white milky sap contains a complex mix of chemicals. The fruits of this tree were a common food for the ancient nomad and the shepherd boys. The fruits of the wild fig tree is not recommended to be eaten on an empty stomach early in the morning, as it might cause some delusion, a property that gave the tree another name of “Crazy fig” by some bedouins. Until now the white milky sap taken from broken brunches of tree is also used by bedouins for curdling to make cheese. 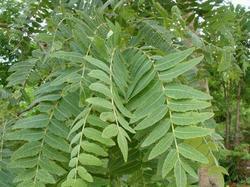 Its leaves is burnt on charcoal along with harmala seeds inside a tent for inhalation is used for goat herd treatment. A treatment used by the Judeilat of the Bedoul tribe in case if the goat herd started to give runny and not thick consistent milk. In the tropics the Ficus tree is important, as objects of worship in most indigenous cultures. The writing of the 1st century BC Greek historian Diodorus Siculus seems to mentions this fruit: "Being eaten, it has the power to effect fantasy. their priests will sometimes used the fruit to bring on such fantasy, which they say is the voice of their God." (From Mariette's Deir-el-Bahari, plate 5.) The huts of the natives are built on piles. The trees are two date-palms in fruit, and three myrrh-trees, the foliage of the latter being indicated by a line bounding the tops of the branches. The round huts were a major factor in arceologists and egyptologists that Punt land should be in Africa. Althought such huts can be found in the Arabian Penesula to this day with people living in them and they are mostly built from Doum Palm same Palm tree found in the wall mural. And it seems that no Botanists were envolved in the study at that time in the early 20's. Because the Arabian Peninsula and its shores of the Red Sea are inhabited by the Doum Palm, and the Sycamore. In Yemen today and on the shores of the Red Sea one still find huts and villages of Huts, and market for selling huts building materials and other products like baskets and rope that are made out of the Doum palm. As with its flora, the fauna there is depiction of animals. Among these animals is the giraffe, which today is only found in Africa. Superficially, this seems to rule out an Arabian location for the Land of Punt. A closer reading of the ancient testimonials, however, reveals that the giraffe was apparently also present in parts of the Arabian peninsula and Levant during the classical period. The ancient Greek historian Diodorus Siculus refers to the species as “camel-leopards”, and notes that it used to roam the area between northern Arabia and Syria. The most definitive faunal evidence regarding where Punt was located comes from baboons (Papio hamadryas). These are among the creatures that are depicted on the Hatshepsut temple walls at Deir el-Bahri, as well as on other ancient Egyptian murals. 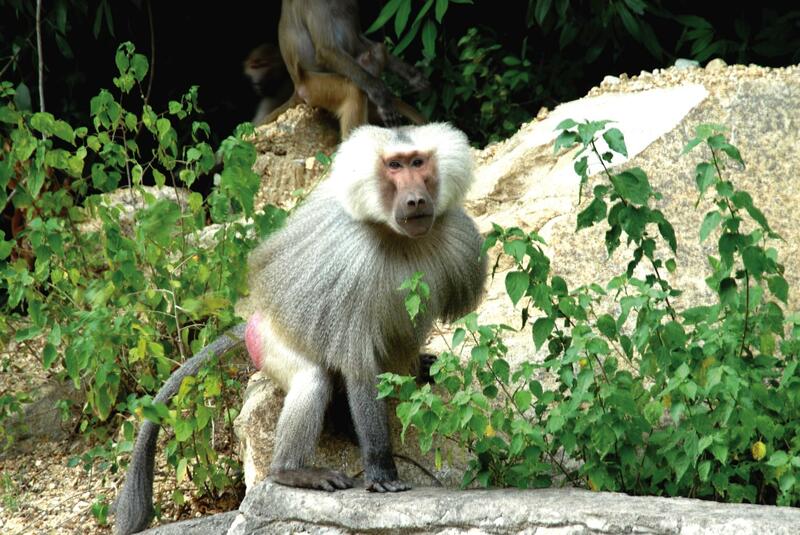 Baboon remains have also been found within actual tombs in the Valley of the Kings. .......it is a well known fact that the Baboons are found in the Arabian Peninsula as well as Elephants from very long time, a fact which the earlier archaeologists have over looked in locating Punt. 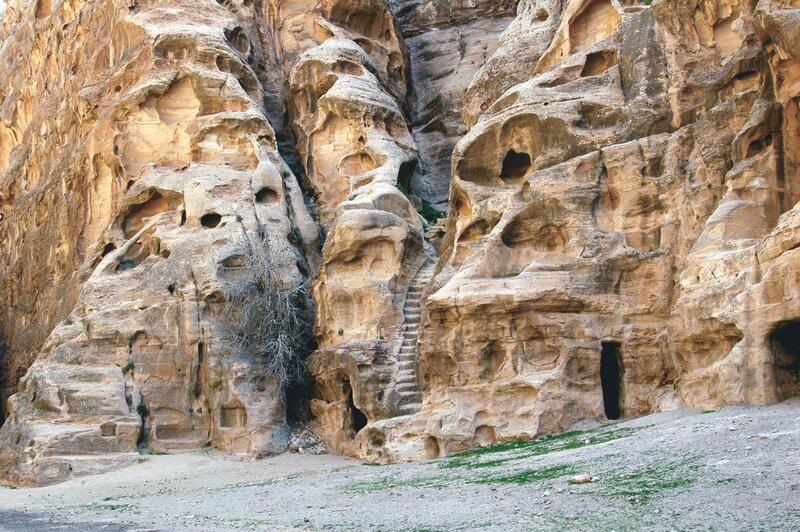 The Hidden Nabatean production facilties at Siq Al Bared — at Beidah near Petra. The caves shows evidence of some kind of processhing facility. 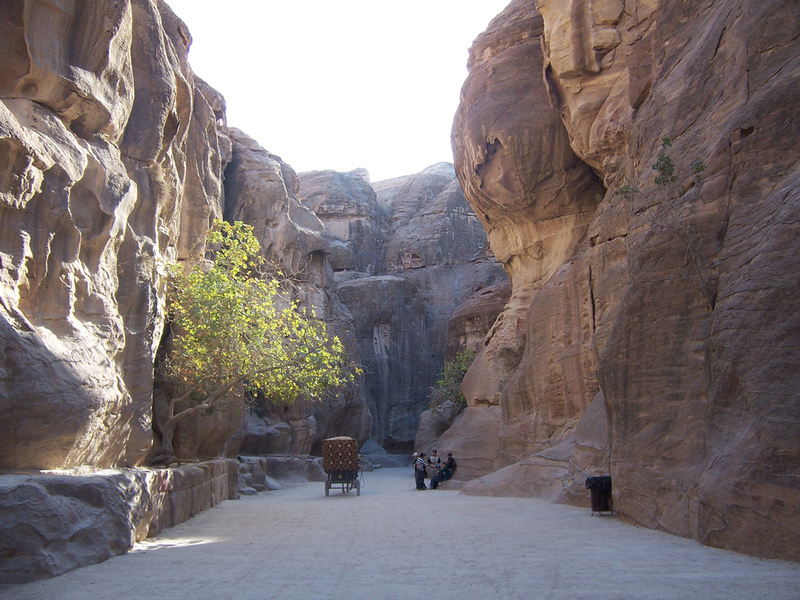 The siq Al bared was found full of ash from the burning of plants.. The plastered painted ceiling. 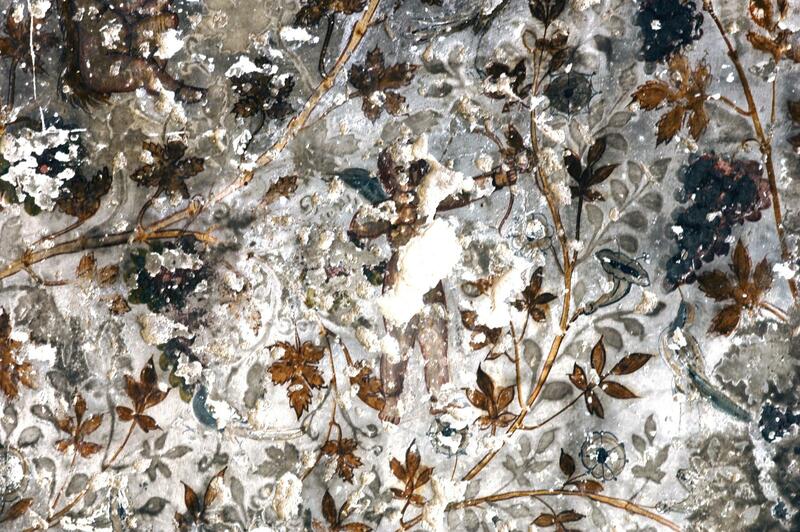 Nabatean depiction on the ceiling of the hidden cave, showing Pan The Archer, along with birds and flowering vines and leaves of a medicinal plants. Pan, in mythology, is the god of shepherds and flocks, of mountain wilds, hunting, as well as the companion of the nymph's. His name originates within the Greek language, from the word paein, meaning "to pasture." 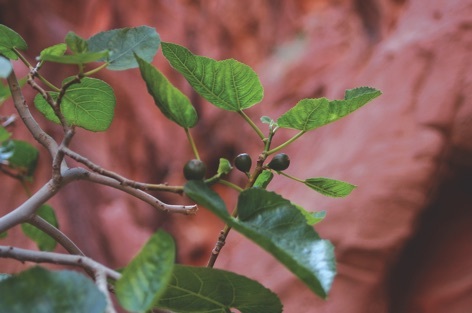 The common Fig tree as found in its habitat between the shaded rock gorge in Wadi Rum and Petra. The wild Fig trees grow from the veins of Peta Cambrian age rock formation. The tree is found in nature comming out of the rocks only in the shaded areas and gourges. 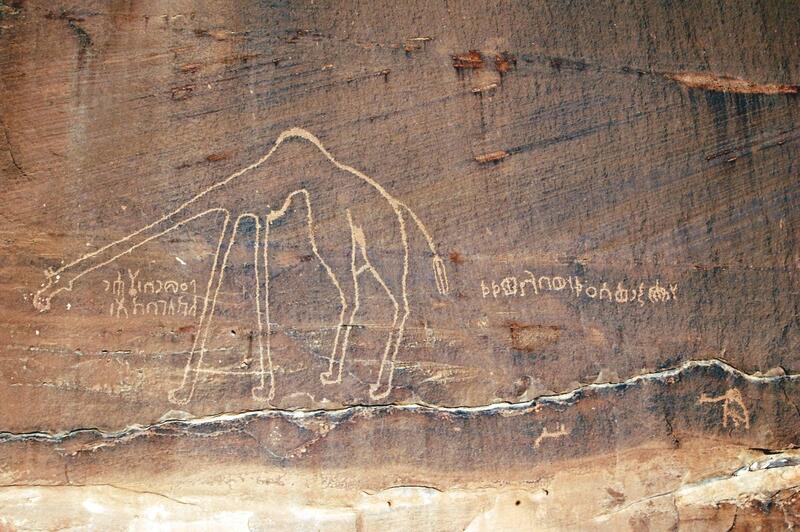 The Wadi Rum Rum rock-drawing of a Giraffe from the Thamudic era, 3000 BC. The Boswellia Sacra, the Yemeni and Omani tree, which seems to fit the drawing most from all the varieties.